Editor’s note: Today, we introduce the newest addition to our growing network of travel bloggers. Michelle Bucher will be our road trip expert for TravelPulse. If you’ve read her Road Trip Blogger site, you know she’s seen just about every nook of the U.S., and much of Canada, all by road trip. If you haven’t seen her work, here’s a great primer on what she’s learned through her six years thus far on the road. In a recent radio interview, I was asked what road trip apps we use while on the road. 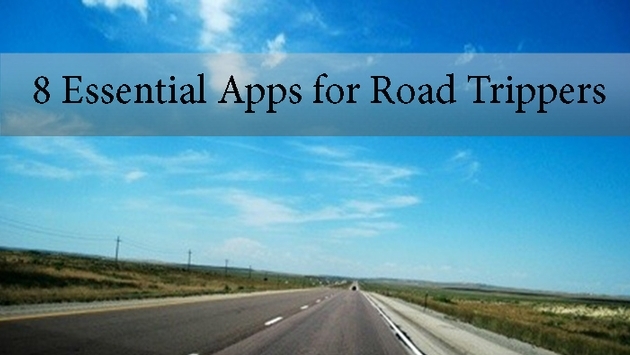 Today we share some of our favorite road trip apps with you. For many road trippers, gas alone equates to more than half of your overall road trip costs. This app allows you to find the cheapest gas prices in the different towns you`ll be traveling in. It’s a great app to have as you can pre-plan your next fill up locations well in advance. I can’t say enough great things about Roadtrippers. We use this app to find fun roadside attractions, quirky establishments, and pretty much suggested things to see/do in each town we plan to visit. It`s a great pre-planner, or even detour app to use while on the road. The best thing you can do while road tripping is explore at least one fun thing in each town you visit. Roadtrippers also has a Google Map feature that shows you how long it will take to drive from one town to another, and a feature that estimates the cost of gas for your trip. We’re pretty big foodies, and love exploring the different foods across the country. TVFoodMaps is an app that lists restaurants featured on different Food Network shows like Drivers, Drive-ins, and Dives. Simply pick the town you want to stop in, and your favorite Food Network show, and pick from the list of restaurants. You can even plan a foodie road trip around the different restaurants featured on your favorite Food Network show. Road trip tip: if you combine Gas Buddy, Roadtrippers and TVFoodMaps together, you can fill up on cheap gas, get some delicious food and find and random roadside attraction in the same town. A great way to be efficient while road tripping. An awesome tip we learned from a fellow road tripper: When road tripping, especially during the winter months, add in the different towns you`ll be road tripping through into your weather app. This will give you weather updates while road tripping, so you know in advance if there’s a flash flood warning, snowfall warning, or whether you should wear shorts that day. Twitter is a powerful tool to have while road tripping. We often reach out to people on Twitter for suggested must-see attractions, food options, local events to attend, and general “on location” information. Before we get to a new city, we often tweet out to tourism accounts, or hashtag specific locations asking for tips or information from people. It’s great to get first-hand information from locals. We also use Twitter for traffic updates and weather reports, e.g. tornado advisories. An essential app for road tripping. We often get lost, even with a GPS. Sometimes you need a little helping hand to get back in the right direction, or to help with detours, find coffee shops or even upcoming gas stations when you`re running on empty. It’s a bit more user friendly than a GPS, and a great alternative for those traveling without a GPS. We also often use Google Maps to figure out how long it will take to drive from one destination to another and how many miles/kms it will take to get there. Roadtrippers also now offers this feature, but sometimes it’s personal preference which app we use while road tripping. We generally road trip with a GSP, and although the GPS gives alternate routes when stuck in traffic, it doesn`t offer real time traffic updates like Waze. We generally pair Waze with Twitter for traffic information, and to plan how to get around traffic jams, and avoid construction areas, but most of the time Waze offers everything we need. This is more of a personal preference. We often use the Orbitz app to book hotel rooms while on the road. Road trip tip: we generally wait until we are a few hours away from a certain town before booking our hotel stay. We do this because some hotels don`t allow for cancelations, and road trippers know that things happen while on the road. It could be a simple thing as getting a flat tire fixed, or wanting to stay an extra day in a different destination, and you`re unable to get a refund on your pre-booked hotel stay. What’s your favorite road trip app? Leave your comment below and let us know which apps you like to use while road tripping. Michelle Bucher is an avid road tripper, travel writer and social media marketer from Vancouver, British Columbia. Michelle has spent the past six years on various road trip adventures around North America. She's road tripped through 48 states, 10 provinces and several other countries. Michelle runs a fun travel blog, roadtripblogger.com, showcasing stories from her random road trip adventures.